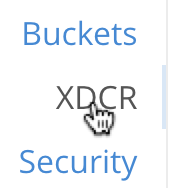 After an XDCR replication has been paused, resuming it restarts the replication of data from the source bucket to the target. The examples in the subsections below show how to resume a replication; using the UI, the CLI, and the REST API respectively. As their starting-point, the examples assume the scenario that concluded the page Pause a Replication. This features information on a single, currently defined replication. In the status column, this replication is shown to be Paused. Replication has now been resumed. The value specified for the --xdcr-replicator flag is that retrieved by means of the --list flag, shown in Pause an XDCR Replication with the CLI. From the starting-point defined above, in Examples on This Page, use the REST API to resume an XDCR replication as follows. The endpoint used here features, in sequence, the id of the reference, the name of the source bucket, and the name of the remote bucket. These were obtained in Pause an XDCR Replication with the REST API. The value of the pauseRequested flag is here set to false. Replication has now been restarted. Once a replication is no longer needed, you can delete it. See Delete a Replication.